Hello, GOLF readers! I can’t tell you how excited I am to be a part of this great brand. But before we get going on this journey together, I think there are a few things you should know about me. First of all, I’m not just the Paige who “Stars in the World’s First Bikini Trick Shot” (a clickbait headline if there ever was one). Nor am I just the “Instagram Beauty” who “Crashes, Burns in Pro Debut” (thanks for that one, New York Post). I’m not ashamed of my social media following, my Sports Illustrated swimsuit shoot, or the tough time I had in my LPGA debut, but these small facets of my life are easily manipulated by the Internet to get views, and they don’t define me as a person. What these headlines don’t tell you is that before taking up the game of golf, I was a young girl with horrible asthma and a hair condition that made me nearly bald until I was about 10 — a girl who was bullied incessantly. I started playing golf after a broken knee led me to quit my career as an elite gymnast. It wasn’t long before I became one of the world’s top-ranked amateur players. Whether it's how to have more fun, how to get better or where to play, Paige Spiranac has all the answers. But at some point, golf stopped being fun, and the pressure to perform nearly forced me to quit. I entered college as a top recruit, but I left without achieving most of my goals. On the range and in practice rounds I was shooting lights out, but in competition I fell apart. It was terribly frustrating. It wasn’t until last year that I figured out the problem: I just don’t love competitive golf. What I love is the game itself. I love being outdoors, practicing, and smelling the freshly cut grass at 6:00 a.m. as the sun rises. But I didn’t love travel, or pressure, or the mean-spiritedness of my competitors. FOR MORE ON PAIGE, VISIT HER GOLF.COM LANDING PAGE Turns out, the enjoyment I receive from growing the game through content creation and collaborations, and the work I do with the Cybersmile Foundation around cyberbullying, is leaps and bounds above what I got out of playing competitively. This realization made me fall in love with the game all over again, and I’m excited to share my energy and passion with you. I’ve played at every level, and I’ve also had the opportunity to play alongside the world’s greatest players. My life is golf. My detractors love to tell me I don’t know anything about the game, but it often feels like the only thing I do know. Through a monthly column in GOLF — which will feature tips, peeks into my life and personally supervised makeovers of lucky (but fashion-challenged) GOLF readers — plus many other contributions to GOLF.com, I want to share the wealth of knowledge I’ve gathered over the years, just as much as I want to hear about your own journey. As we kick off our partnership, I hope you can open your mind and get past the clickbait. I know we can create something special. Together. Paige Spiranac at Legends Golf & Resort in Myrtle Beach, S.C.
Where I'm traveling: Myrtle Beach, S.C. I recently made a trip to the South Carolina lowcountry as part of my partnership with Play Golf Myrtle Beach. Above and below is Legends Golf Resort. The original plan was to play with some contest winners, but we decided to move the round to next spring to let some facilities recover a bit more from Hurricane Florence. The good news? Most of the courses along the Grand Strand are up and running and in great shape! And the fall season is a wonderful time to visit. 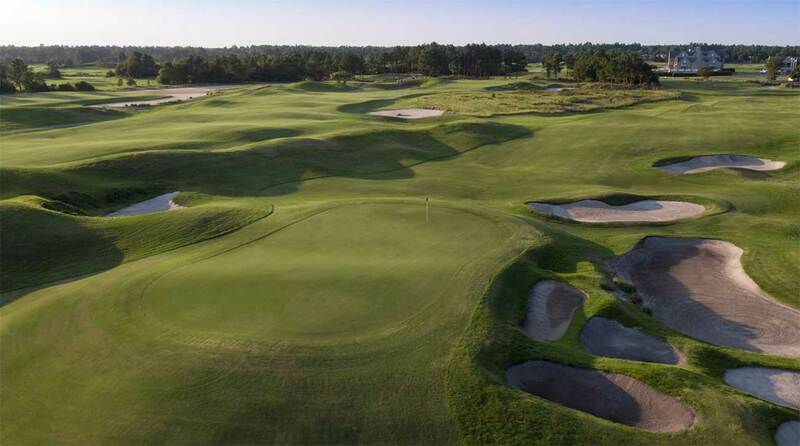 Legends Golf & Resort in Myrtle Beach, S.C. I had a big issue with bringing my range game to the course, until I began attaching consequences to every swing. When I visit the range now, I actually “play” a round as I’m emptying the bucket. In my head, I envision certain golf holes, and award myself points (on a scale of 1 to 10) based on how well each shot would have helped on the course, and bonus points for confidence and trust. On this swing (below), I’m picturing a par 3 at Troon North, where I often play and practice. The yellow flag is my target. I remember giving this shot a “9.” Practicing with a purpose works. It’s also a ton more fun. Turning range time into game time — treating each session like a round of golf — will sharpen your focus and skills. Got a question for Paige? Or need her to boost your swing or style game? Send a note (or pic!) to [email protected] For more on Paige, click here.